This carpet is designed in a unique floral pattern which is "One of a kind" and woven on a handloom. This is easy-to-maintain and ideal for the living area. 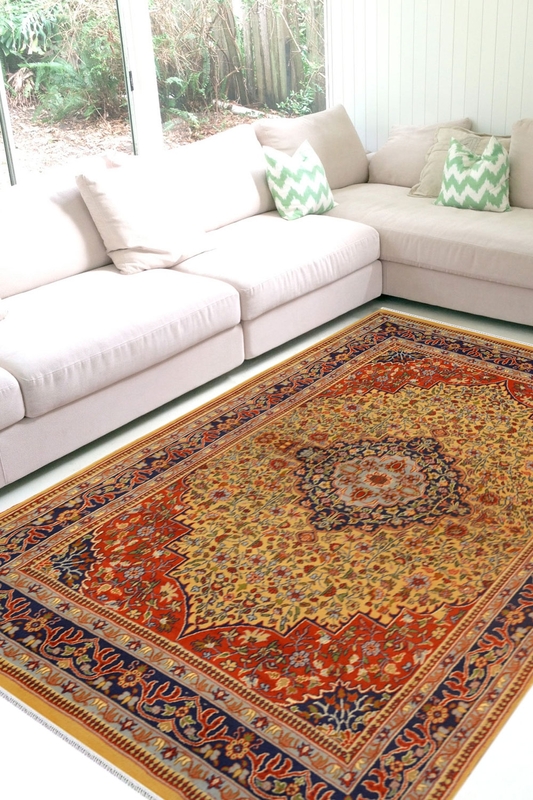 - Charm and elegance unite in the playful floral pattern of this wonderful hand knotted Kashmiri woolen area rug. - The stylized blossoms in rich tawny tones on warm gold bring a garden of delight into any room. - This is 100% handmade area rug and beautifully handcrafted by our experts. - This beautiful carpet is made of cotton and wool. It means the warp in pure cotton and weft in 100% New Zealand wool. - It has an intricate floral design pattern with small motifs. - The primary colors are orange, gold and blue. - It has taken 6 months approx to weave.